At a press conference in Atlanta on Wednesday, the Hawks introduced a trio of new uniforms and a fresh set of colors, including volt green, a new gray and red. With all the chatter about the new Atlanta Hawks uniform set—three completely redesigned looks that introduce two new colors—don’t forget about the shoelaces. They signify a major shift in uniform design we’ve never seen in the NBA: the mix-and-match. Sure, the Hawks offered up a nod to the past in a contemporary way with a “volt green” based off the franchise’s old lime green and become the first NBA team with gray in the color drawer. But that color drawer must now also contain a full sampling of socks and shoelaces as the three Hawks uniforms create a mix-and-match opportunity. The mix-and-match concept wasn’t present at the start of the design discussion, but when Sorckoff moved toward a different colored waistband to offset the feather patterned background of the uniform top, the concept started to shift. “When you started to look at it, why don’t you put a red top on gray shorts and it actually looked really good,” Sorckoff. With the NBA’s identity head, Christopher Arena, in on the concept, saying the NBA would allow the unprecedented move as long as colors didn’t clash, the mix-and-match took on a new life. The Hawks also brought in Stance Socks, the NBA’s new apparel partner for hosiery, to create matching socks for the new package and is working with Nike, Adidas and Under Armour about matching the multiple colors on the footwear. Sorckoff says that it wasn’t until recently that he heard the story of why the Hawks, in 1970 with Pistol Pete as their star, changed to lime green and blue, a change that lasted only two years. “The franchise was still essentially wearing the colors and uniforms of the team that had played in St. Louis,” he says. “At the time (of the change) they talked about how nobody had ever used the color lime green before.” Forty-five years ago the Hawks tried to give their team a true Atlanta identity with lime green. Plus, having the only gray in the NBA—“part of this was introducing some colors we could own”—was a nice addition, as was a dark base for that feather pattern to play on. With the mix-and-match, the green and gray and the head-to-toe color scheme, the new pattern almost gets lost in all this rebranding. The V-shaped pattern derives inspiration from the breast of a Hawk. On the white home uniform, the pattern goes gray. On the gray primary road, the pattern shows in black and gray. Making such a major shift in the team’s brand all started years ago, Sorckoff says, when the nostalgic Pac-Man logo was “evolved” and introduced as a secondary logo. That was this plan set in motion. From the major moves of colors, mixing and patterns, Sorckoff says plenty of other smaller points of interest weren’t lost on designers. 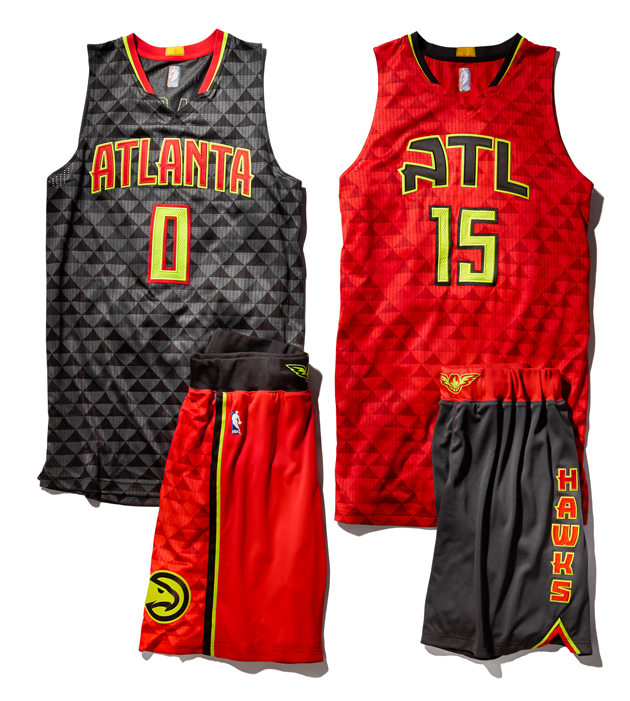 The new font for the Atlanta on the two main uniform tops, the ATL on the alternate road look and the Hawks down the short side were custom made. “We didn’t want to pull something off the rack,” he says. Having an asymmetrical short with the pattern and simplified primary logo on one leg and the Hawks lettering down the other leg was also a nod to the past, that 1970 uniform. In that introduction 45 years ago, the Hawks debuted asymmetrical striping, the first time it had ever been done. “As a franchise and brand they were doing really, really innovative things, being the pointy tip of the spear with the visual identity,” he says.